After 10 years running my own yoga business and teaching kids yoga, I have discovered a powerful way of keeping creativity flowing. I use it when I develop a new curriculum or write a blog post. Without stirring my imagination I can’t get excited about my business. Creativity and Imagination are essential for a successful business and also for my own happiness and satisfaction with life. Yet, sometimes we feel stuck creatively. Whose fault is it? Those things, people, circumstances we believe are boxing us in? Or is it our fault for for letting them? The free tele-seminars I’ve been listening to with Tulshi Sen have revealed how to Raise Your Belief Level. He says, “You don’t get what you want, you get what you are.” We want to live a creative, meaningful, exciting life, but we don’t really believe certain things are possible. We don’t get what we want, we get what we believe. Sometimes we don’t even know what we want even if we did believe. We’ve got to go back to basics and stir the Imagination to let us start dreaming again. 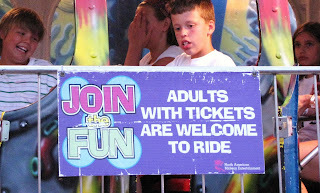 Like the sign says in the picture – we want to JOIN THE FUN, and the tickets we need as adults are imagination and creativity. Creativity is in every five year old. If we find the five year old in us, we’ll find the creativity. Can you remember what it was like to be five? Start by imagining this to Join the Fun. Can you see the world through the eyes of a child? The kids I teach are excited about life. They like to get up in the morning. They’ve got a dream, they’ve got a rocketship to build, they’ve got a crocodile to track. They have passion for life that lets them smile easily and laugh often. To stir creativity and give yourself something to get up for in the morning, think back on your favorite play activities as a child. Can you remember a favorite joke? Did you like puzzles, art, building, games, maybe pretending? Make a list of toys you loved and what you loved about them. Today I was talking to a supervisor in her office at the daycare. Through the hallway and into the office travelled the sound of the xylophone, but this was no song I had ever heard. It went on and on without stop and continued on in a cacophony of notes. As I was leaving the music continued and I passed by the doorway to see a 5 year old girl absorbed in playing her instrument. All the kids were doing activities, and she sat alone on the carpet making music. She looked up, smiled, then went right back to her personal symphony. What engrosses you in this way? I’m not saying you take up Tinker Toys, but these are the clues to your hearts passion. Next, daydream a little. Daydream like a 5 year old who doesn’t understand “impossible.” Imagine you didn’t need to have a job and you could do whatever you wanted. What clues would you get from your childhood toys. Would you play the xylophone in an orchestra, on American Idol, or in a spaceship? Think of all the things you could do and also how you would feel doing it. Do you feel brave, independent, strong, healthy, imaginative, romantic, playful? All day long we work for security, but when do we take time for our happiness? What is the point of having security if we don’t have any of the feelings that we want to feel? Children usually don’t think of security, they think of what makes them happy. Then imagination flows and we start to see all kinds of possibilities for happiness. We notice opportunities and connections we may have overlooked before. We find possibilities for self-expression that we missed before, and we begin to dream of a creative life again. Seeing life through the eyes of a child, the imagination is stirred and we Join the Fun even as an adult. Do you have a way of stirring your imagination. What do you do when you feel stuck? Please leave your comments and ideas. P.S. 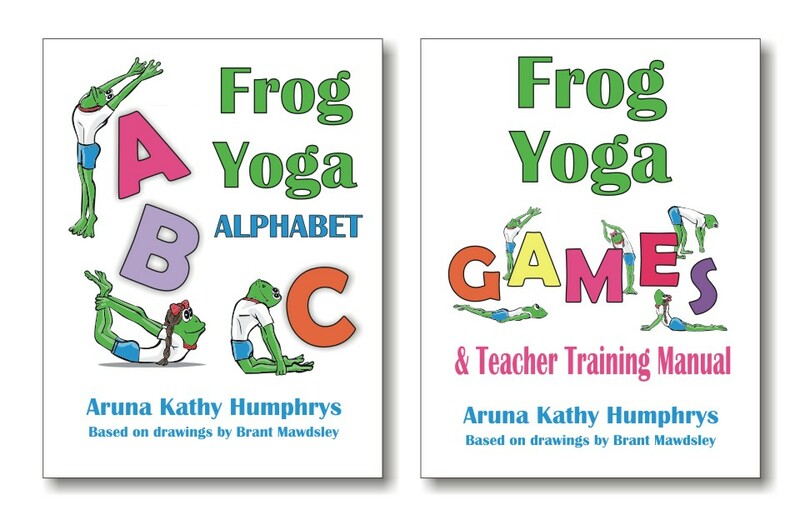 my next Kids Yoga Teacher Training in Toronto is Sat. Sept. 26 & Sunday, Sept. 27. Spots are starting to fill up so reserve your place today and take advantage of the early bird discount. P.P.S. To listen to the free tele-seminars with Tulshi Sen on Raise Your Belief Level – click here. There is a call tonight at 10 pm Eastern Standard Time. Thanks all, I agree the more we can be in the moment the better! Claire – you must have one lucky dog, I will try to notice my creativity – I tend to be a recipe follower. @classrooming – will check out your site. An inspiring thought!Developing creativity in the young minds is really a good and interesting task.Imagination,creativity,love of life,etc can be seeded in to the minds of children by the practice of yoga.A wonderful website renders valuable information about teaching yoga for students. i often find inspiration and creativity in the kitchen. when im stressed, stuck, or being stupid with my life, i take a day to cook. sometimes i follow recipes, other times i throw together soups or stews. i love finding new combinations and substituting ingredients. it is a simple way for me to be adventurous without having some disastrous effect. (i can always feed the dog what doesnt work out! hehe) thanks for your insight…got my creativity flowing just reading this and recognizing where mine might come from. What an insightful post! I also find that working with kids, yoga for kids, and helping others to do the same, requires being really, really present in every moment. Children live in the present moment by definition. If we can 'be a child', it opens all kinds of doors – to creativity, openness, imagination, and love of life that can be hard to come by as an adult. I think that having the ability to view life from a child's perspective is a prerequisite for teaching children, and even being a good parent. I've posted some similar blogs at http://www.childlightyoga.blogspot.com.